Behavior change takes individual effort. And it won’t happen until a person recognizes the need to change and is willing to put effort into making it happen. WellSuite® IV Health Risk Assessments (HRAs) use the Transtheoretical Model (TTM) created by research psychologists Drs. James O. Prochaska and Carlo C. DiClemente to identify where someone is in the decision-making process. 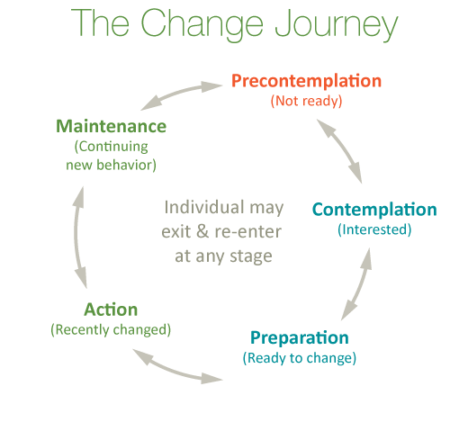 This behavior change model recognizes that people often have difficulty moving through the cycle. The WellSuite® IV HRA assesses which stage of the change journey an individual is in for habits linked to increased health risk, prompting the user with change readiness questions where appropriate. Here is an example with Physical Activity. The question changes depending on whether or not the user reports a healthy level of physical activity. Wellsource client Nebraska Medicine utilized WellSuite IV Personal Report data and saw a 400% increase in fitness center usage. “Strategic decisions we make about our wellness program can help people make major lifestyle changes,” says Laurie Wilburn, Director of Total Rewards and Human Resource Operations at Nebraska Medicine. Want to learn more? Request a consultation.